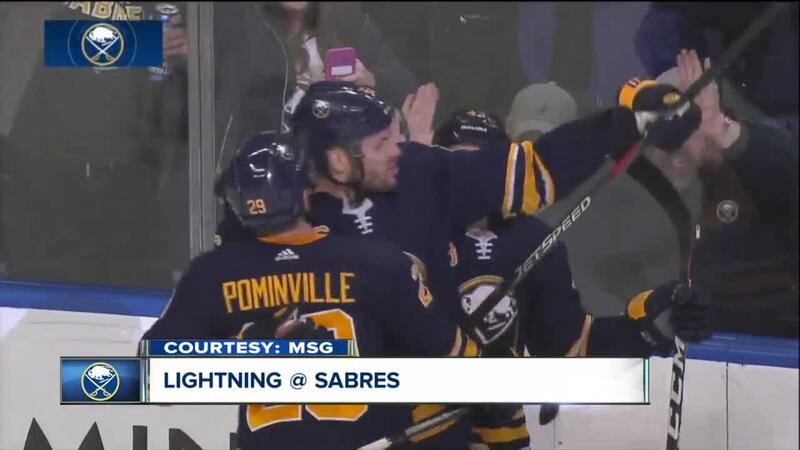 BUFFALO, N.Y. (WKBW) — If the season ended today the Buffalo Sabres would miss the playoffs. With their 5-3 loss to the Tampa Bay Lightning on Saturday, the Sabres fall to ninth place in the Eastern Conference standings with 52 points. It wasn't that long ago that the Sabres had the best record in the NHL [20 games ago]. Now the Sabres are on the outside of the playoff picture looking in. With Montreal's win over Colorado on Saturday, the Sabres are one point behind the Canadiens and tied with the Islanders [52 points]. There is plenty of time to mount a comeback. But the Sabres are trending in the wrong direction. Canadiens win, #Sabres lose. For the first time in months, the Sabres are not in a playoff spot. KeyBank Center erupted in boos after Jack Eichel was called for elbowing with 6:10 left in the third period. Eichel collided with Ryan McDonagh behind the net to negate a Sabres power play and send the Sabres captain to the box. Seconds later, Steven Stamkos scored the game-winning goal on a perfect shot past Ullmark. Of all the moments that happened in Saturday's game, this will be the one fans remember. Was it the right call on the play? I can make the argument both ways. An important angle from the Eichel elbowing penalty on McDonagh. You can see McDonagh's head snap, even in slow motion, and players are paranoid about head injuries. But it should have never gotten to that point. The Sabres made a bad change on the play and Stamkos took advantage of Casey Mittelstadt playing defense. Oh yeah, Ullmark could have probably made the save, too. On Saturday night the better team won. Many people, myself included, think the Lightning are the favorite to hoist Lord Stanley’s Cup at the end of the season. They’ve shown just how good they can be in the first three months of the season and it doesn’t look like they’ll slow down anytime soon. Unfortunately for the Sabres, they just aren’t as complete of a team as the Lightning. Perhaps in a few years, that gap will tighten or the Sabres will leapfrog Tampa Bay. But right now the Lightning are a dominant force. And for whatever team sneaks into the playoffs as the eighth seed, they’ll be rewarded with a best of seven series against the Bolts. Good luck. Less than 24 hours after he was sent back to Rochester, C.J. Smith put on a show. In his first game back with the Amerks, Smith scored three goals and added an assist en route to a 5-1 win over the Toronto Marlies. As to be expected, plenty of Sabres fans voiced their displeasure that Smith was sent back to Rochester, especially after his huge performance Saturday afternoon. After scoring his first NHL goal on Tuesday night, Smith was starting to stand out and make an impact with the Sabres in Buffalo. But rather than waiving Remi Elie, the team elected to send back Smith to Rochester and keep Elie on the roster. I understand the frustration level -- especially for a team that's desperately trying to generate goals. But try and be patient. I wouldn't be surprised if Smith made his return to Buffalo in the near future and by the end of the year was a regular in the lineup. It's way too early to know if Smith will become a full-time player in Buffalo -- but he'll be given the opportunity. The next time the Buffalo Sabres hit the ice for a game at KeyBank Center it'll be February. Next week the Sabres will head to Western Canada for a three-game road trip where they'll take on the Oilers, Flames, and Canucks. After their trip, the Sabres will have 10 days until their back on the ice, once again on the road against the Blue Jackets. Moral of the story - grab at least six of a possible 10 points up for grabs in the next two weeks and return home in a favorable position. Despite their loss Saturday, the Sabres have been much better on home ice this season than they have been in years past.